I hope everyone had a wonderful Thanksgiving with family this year. We have a lot to be thankful for. Darryl is stable and we are really enjoying our time with him. He is such fun and uplifting to us. This is a difficult time in our lives and horrible for Darryl. I find that my concentration level is not very good when trying to start on some of my complex projects and it becomes frustrating. So I am working on smaller projects that will not require the intense concentration needed in making heirloom quilt. In my last post (17 Nov) I indicated that I would start on my Bird of Paradise (original name) quilt – but still trying to decide on which pattern to use. 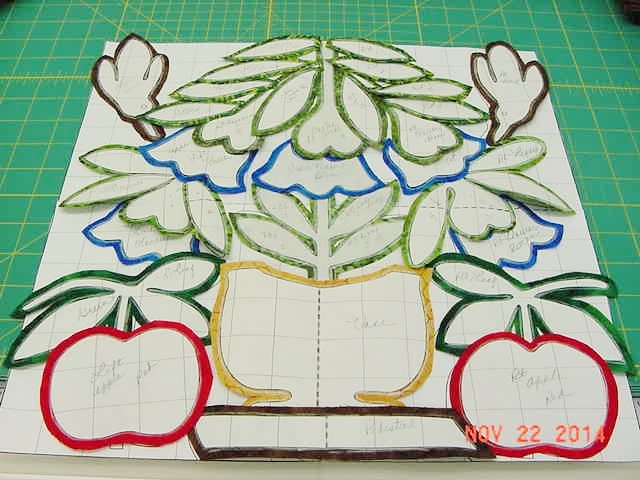 I started with the A Bountiful Life pattern. A couple of my quilting buddies had told me about freezer paper (pre-cut to 8 1/2 x 11) that one could print applique pieces from the computer, or copies. What an experience. I jumped right in to my new “time saver” project. I printed the out the 4 quadrants of each block from the book on regular paper and then again on the freezer paper. I could see the ink cartridge emptying before my eyes (LOL). But I justified the expense because of the time I would be saving! I proceeded to tape the freezer quadrants together with some special scotch tape….I thought I was really going to breeze through this process and be on my way. I was until I cut out all the pieces for Block 1 and skipped over to the iron and BAM! Gee if you put a hot iron on the tape, it melts and melts on the iron (see what I mean about concentration, creativity and the ability to think when under stress – there isn’t any). I figured out a way to remove the tape (I think I tried to place something over the tape but that did not work either – another DUH!). But I did get Block 1 preparation completed and have been working on it. I realized that this paper is only good for a one page pattern, OR make 2 copies of things and cut out areas and then reprint……EXPENSIVE AND TIME CONSUMING! I have decided that I will to go back to the old-fashioned way of TRACING each piece! Lesson Learned $$$$$$. Here is the applique process I use for my needle turn applique. I will be using Batiks for my quilt. Notice the doted lines – this is where I used the tape that quickly melts when a hot iron is placed on it….. LOL Not sure if I will be able to top this stupid thought process, well maybe I can as time will tell. Lesson Learned: Do not start a complex quilting project when under stress! OK – Now to continue on with the “no brain” quilter. After my disaster with the freezer paper, a friend of mine asked me if I had any patterns for the Antebellum Ladies. She wanted a lap quilt made with the Ladies of that Era. 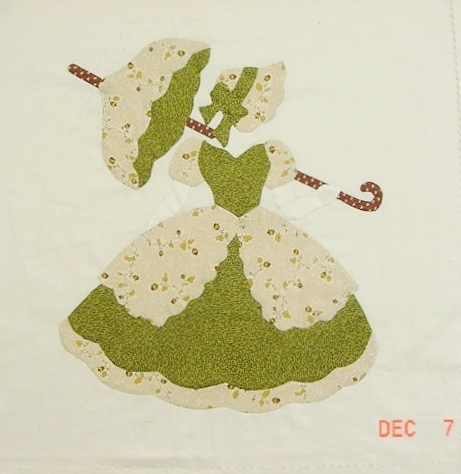 I found an old pattern titled, Belle of the Ball by Cindy Surina. Wanda’s request provided me a challenge and inspired me to continue on quilting, but with a project that is not so complex and detailed. Selecting the fabric took a day or so because I knew the colors she would like but could not decide on Reproductions or Batiks. I settled for a fabric line called Charlottesville from Connecting Threads that I had purchased a couple of years ago. Because I have an abundance of the lovely 8 1/2 x 11 freezer paper and the fact that the pattern would be much easier to print out, I decided to “save time” by using it rather than tracing the pieces. One thing about being brain dead – you can keep repeating the same process thinking the result will be better, but one still achieves the same result – PROBLEMS. The quilt will have 4 Ladies Blocks and I have absolutely no idea how I will do the setting, but it will come, I am sure. So here we go with Lesson Number 2 for the month! I started having some problems when I started appliqueing the blocks – the pieces were not fitting correctly on the back ground fabric and I had to re-cut some pieces a few times. 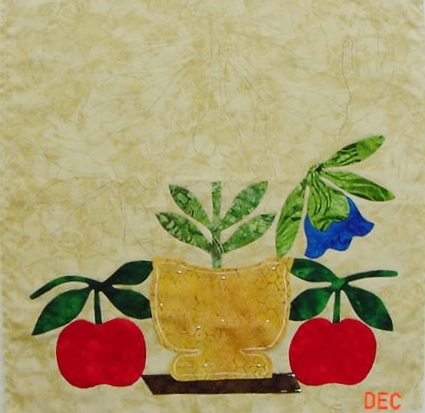 I never have problems with my applique pieces fitting on the background fabric – UNTIL THIS PROJECT. Last night I finished Block 3 when the light bulb came on!!!!! My printer was printing the freezer paper pattern about 1/16th of an inch smaller than the original pieces! Believe you me – 1/16th of an inch is enough to drive a quilter to give up quilting forever. So now I am down to the last one and of course, the fabric pieces have already been cut – so I know I will have to be ever so careful so I do not become frustrated and throw it in the trash can! I wonder if any other quilters out there in the Quilt world ever get this frustrated. The Ladies look fine, but getting there has been an experience. 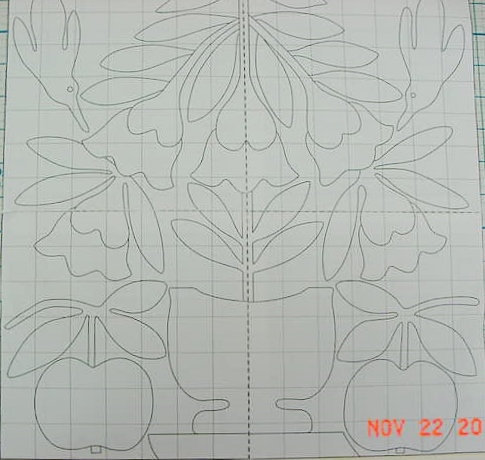 Lesson Learned: HAND TRACE ALL APPLIQUE PATTERNS. There are no short cuts in the process! I will NOT be using this freezer paper for printing a pattern until I figure out how to get my printer to print a perfect and accurate size of a pattern template or applique pattern pieces. I have already printed out a few blocks of Love Entwined pieces – but those will be going in the trash can. For the time and money I have wasted this month on brainless decisions I could have purchased the Stonefields Quilt for $200.00! But I guess this is just part of life’s little pleasures and lessons. Here are the finished Ladies Blocks 1 through 3. Clay and I have decided that it is time for a trip to the Choctaw Casino in Durant, Oklahoma for Christmas. We will be there for the entire week of the Christmas! I plan on taking absolutely NOTHING to work on – just enjoy the getaway! Clay told me I need to be a BIG Winner at the Casino this trip to recoup my brainless decisions! I will try. I am hoping for a snow storm so I can once again enjoy a White Christmas. The last one was in 1996 when I lived in Sterling, Virginia. Ah, the 1996 Blizzard! So much fun. If I cannot have snow, cold weather will be so nice. We had a nice spell of cold weather in November, but now we are back to the 50’s at night and 70’s during the day – UGH! I know that we will come back refreshed and ready for the New Year. We will spend New Year’s Day with Darryl. 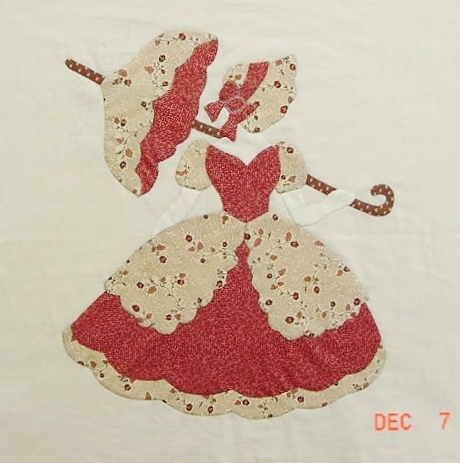 Heck – I may even find my creativity again and finish Wand’s Antebellum Ladies quilt! 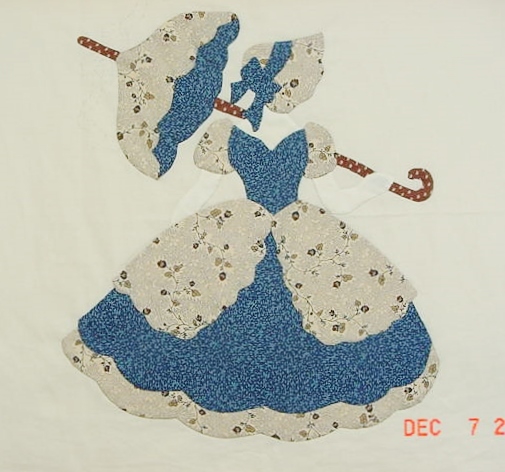 This entry was posted in Uncategorized and tagged Belle of the Ball Cindy Surina, Bird of Paradise Quilt Top, Choctaw Casino, Civil War Bride. Bookmark the permalink. Sometimes things conspire to drive us mad! But I love your start on the Bountiful Life pattern, and the Ladies are adorable. Thank you Jane. I am so ready for the Casino – There one cannot think about anything – just how much money you have to feed the machines! LOL. For me it is a wonderful way to shut down, have fun, and be refreshed upon returning home. Thank you for your comments. I did something right then…………YEA…. Thank you Rosemary. I had a 4 AM vision for HS this AM. I am going to now put the border on with the hexie flowers, then the next border will be churndash blocks or maybe some 9 patches and alternating plain 3″ squares. I need to do something to reduce the effect of the circles.